Hope you've all had a nice day! I've been so busy... I took my son to a mum and baby group this afternoon which I LOVE doing, he has a great time and I get to sit and chat! He was exhausted afterwards so he's been sleeping lots! Today I have one of my holos from my swatching day! I have a long history with HITS Atena... I wanted it ages ago and it was sold out on Llarowe. Then it was my friend's birthday in February and I wanted to get it for her because she loves pink, but it was still sold out, so I got her a baby pink Ludurana holo instead. I ended up getting this directly from Speciallita from Brazil when I did my order. 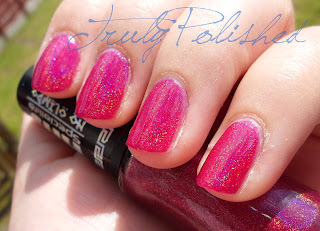 Atena is a berry leaning hot pink with a really strong holographic effect. I really wish the holo would have shown up better in the photos, but for some reason my camera didn't like it! The application on this couldn't have been better, it covered well in two coats. 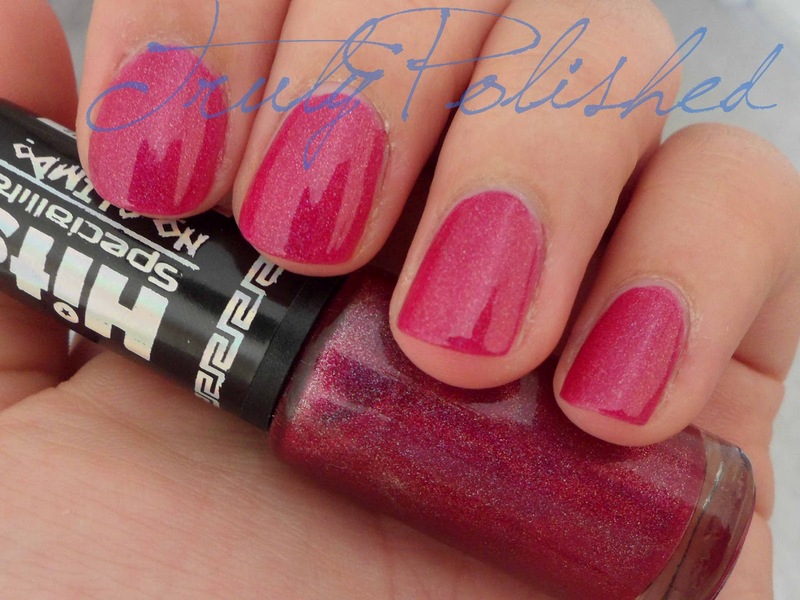 This makes a really nice change from Poseidon (four coats) and Dionisio (three coats). I really wanted to keep this on for longer but I swatched it first! These photos show two coats without top coat. I love the base colour in this, the hot berry pink is really flattering and in my head I'm matching it with loads of summer outfits! It would look great matched with florals or pastels or even to add a pop of colour to a neutral outfit, this shade of pink is just perfect! You can buy this from Llarowe for $10.00, but I bought it directly from the Speciallita HITS site for R$8.50.